Greenman Solar are based in our own state of the art, green energy showroom and solar PV demonstration/education facility just outside Ashford in the heart of Kent. Greenman Solar are the Green Engineers and experts in all aspects of high quality Solar PV design and installation. We help you to make and to save money with clean, green, solar energy. We are a fully qualified MCS accredited company with further qualification to the REAL code of practice. We are currently working on a wide range of diverse solar projects from 50kw+ farm and commercial arrays, to small domestic installations. We specialise in high end, engineered, quality, projects and pride ourselves on our imaginative yet very competitive solar solutions. Court Lodge Manor is a small moated estate, in a lovely rural setting just outside the market town of Ashford in Kent (the garden of England). 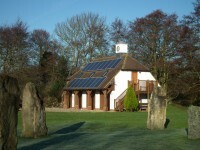 We welcome potential customers to come and visit us at Court Lodge, where we have our own beehives, orchard and Solar powered home and offices, not to mention the most easterly stone circle in Britain. You are welcome to make an appointment to come and see our fully working Solar PV array that powers our offices and our home in Ashford, as well as generating a significant income in FIT payments. Trust Greenman Solar to design and install a maintenance free Solar PV array that will give you free green electricity, pay for its self in a very short time and give you a guaranteed income for at least 25 years. At last a way to do something very positive for the planet its environment whilst significantly reducing your carbon footprint. Improve your green credentials and earn a good return on your investment at the same time. We have 25 years of high level engineering experience and have full MCS and REAL accreditation. Our attention to detail along with our 3 year installation warrantee, 5 year inverter guarantee and our free 25 year module performance protection, coupled with our seven day a week local technical support, give you the peace of mind that only a quality local company can bring you. Greenman Solar are MCS accredited engineers who supply and install Solar PV. For similar installers in this area please visit the Ashford solar page. 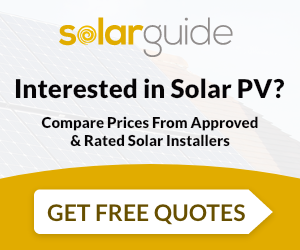 "I would recommend Greenman to anyone interested in fitting solar panels"